The clinical significance of the preclinical studies is unknown. Prolonged QT Interval XOSPATA has been associated with prolonged cardiac ventricular repolarization (QT interval). Perform electrocardiogram (ECG) prior to initiation of treatment with XOSPATA, on days 8 and 15 of cycle 1, and prior to the start of the next two subsequent cycles. Interrupt and reduce XOSPATA dosage in patients who have a QTcF >500 msec. Hypokalemia or hypomagnesemia may increase the QT prolongation risk. Correct hypokalemia or hypomagnesemia prior to and during XOSPATA administration. 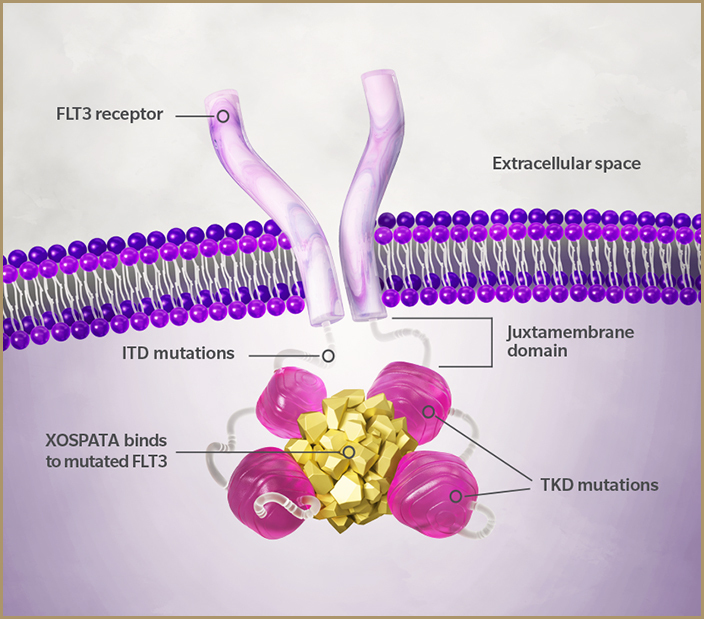 AML=acute myeloid leukemia; FDA=Food and Drug Administration; FLT3=FMS-like tyrosine kinase 3; ITD=internal tandem duplication; m+=mutation positive; TKD=tyrosine kinase domain. Annesley CE, Brown P. The biology and targeting of FLT3 in pediatric leukemia. Front Oncol 2014;4:263. Mori M, Kaneko N, Ueno Y, et al. Gilteritinib, a FLT3/AXL inhibitor, shows antileukemic activity in mouse models of FLT3 mutated acute myeloid leukemia. Invest New Drugs 2017;35(5):556-65.